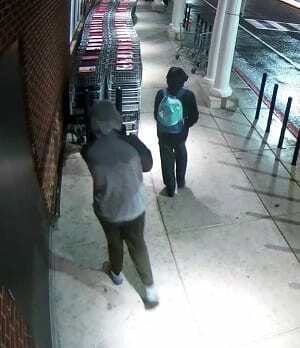 Police in Baltimore County are asking for the public’s assistance in identifying four suspects involved in the burglary of a liquor store in Essex two weeks ago, which included the theft of scratch-off lottery tickets. Detectives have obtained surveillance video of two of the suspects who are responsible for breaking out a window and entering the Waterview Wine and Spirits liquor store located at 139 Orville Road (21221) at around 11:45 p.m. on Tuesday, March 6. One suspect is significantly taller than the other with a distinctive walk, which detectives hope will help lead to his identification. The two suspects loitered outside of the liquor store before the shorter of the two broke out a front window and entered the store, taking cigarettes and scratch-off lottery tickets from a display case. 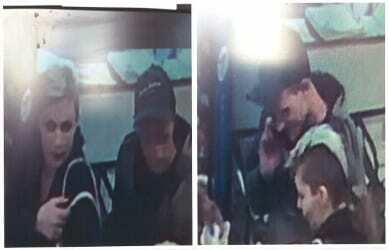 The taller suspect remained outside, acting as a lookout, until they both fled the area on foot. A second set of suspects, believed to be a male and a female with a partially shaven head, were caught on surveillance camera attempting to cash some of the stolen lottery tickets at a Royal Farms store on Eastern Avenue near Kane Street in Baltimore City. Anyone with information on this crime or any of the four suspects involved is asked to contact police at 410-307-2020. Anonymous tips can also be called into Metro Crime Stoppers at 1-866-7LOCKUP. You can view surveillance video from the incident below.